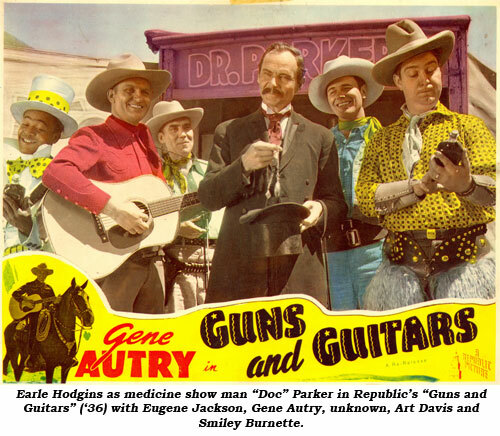 Earle Hodgins was a versatile character actor who excelled at playing a medicine show man, sideshow barker, auctioneer and snake-oil con-man. Hodgins’ comedic talents and snappy stream of patter brightened up over 364 film and television roles from 1934 to 1963, of which 133 were western movies, some 69 TV westerns and small roles in at least five serials. Additionally, he worked in radio and lent his uncredited voice to several Porky Pig cartoons in the ‘30s. Born George Earl Hodgins October 6, 1893, in Payson, UT (south of Provo on I-15), his mother was Minta Adair Hodgins. She was only 20 when George Earl was born. His father was George Nelson Hodgins, born in Canada. By 1900, Earl (still spelled with no “e” at the end) was residing with his mother in Salt Lake City. According to census records, by 1910 Earle (now adopting the “e”) was living in Berkeley, CA, with his mother and her new husband, William Old, 21 years Minta’s senior. At 24, Earle registered for the draft in Oakland in 1917, but there is no record of him being called, as in 1918 he was working in a barrel house for Standard Oil in Richmond, CA. According to 1920 census, William Old was no longer listed as a family member but his children by a previous marriage were living with Minta, indicating Old had probably died. By 1925 Earle was married to Elizabeth Briss Davidson who was born in 1899 in Scotland. In the 1930 census Earle, now 37, and his wife were living with his mother and stepsister, Virginia Old, in Oakland. However, Earle was fibbing about his age, telling census takers he was 32. Oddly, in a Nov. 1939 newspaper article Earle mentions a 13 year old son. That son, Gordon, was born in Canada in 1926. From ‘40-‘48, voter registration records place Earle, Elizabeth and Gordon living at 2447 N. Beachwood Dr. in L.A. (what is now Hollywood Hills). There is no record of how Earle gained voice or acting experience, but he was in films, uncredited as a carnival barker in “Whirpool” in 1934. From then on he was never at a loss for work—usually making anywhere from 12-20 films per year, with a record 26 screen appearances in 1943. Of course it would be nigh impossible to list every role Hodgins played, but here are a few highlights of his more noticeable parts. His first time out with his traveling medicine show spiel was in John Wayne’s “Paradise Canyon” (‘35). He’s so effective I had my dollar out ready to purchase a bottle of his cure-all tonic! 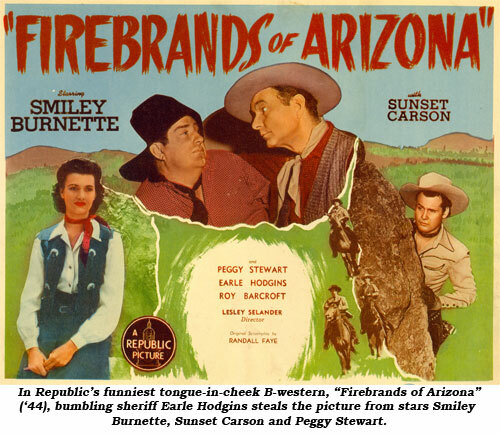 He reprised this role dozens of times, f’instance in “Border Caballero” (‘36) with Tim McCoy; “Guns and Guitars” (‘36) with Gene Autry; “Outlaws of the Prairie” (‘37) with Charles Starrett; “Ranger’s Round-Up” (‘38) with Fred Scott; “Call the Mesquiteers” (‘38) with the Three Mesquiteers; with his pet elephant in “Home on the Prairie” (‘39) with Gene Autry; virtually starring in “Sagebrush Family Goes West” (‘40); “Santa Fe Marshal” (‘40) with Hopalong Cassidy where he has more screen time than in any other western, letting out with possibly his all-time best and belly-laugh funniest medicine show spiel; and “Boss of Bullion City’’ (‘41) with Johnny Mack Brown. 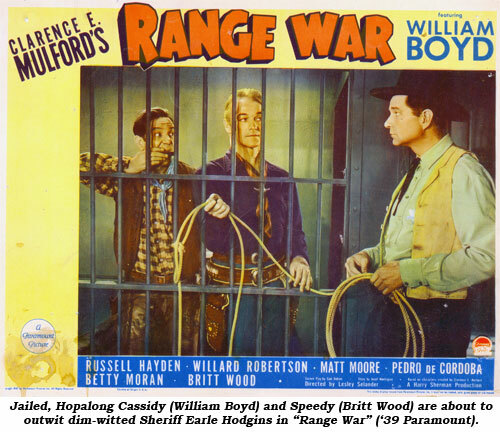 the right side of the law he portrayed sheriffs in “Aces and Eights” (‘36) w/Tim McCoy, “A Lawman Is Born” (‘37) w/Johnny Mack Brown, “Pride of the West” (‘38) w/Hopalong Cassidy, “Gun Town” (‘46) w/Kirby Grant (a bumbling sheriff) and in the classic “Firebrands of Arizona” (‘44) in which Earle practically steals the picture from Smiley Burnette and Sunset Carson with his outrageous mannerisms and ad-libs. Hodgins steals every scene he’s in as a slow-witted deputy in “Red River Robin Hood” (‘43) w/Tim Holt. One exchange between Cliff Edwards and doubly-dumb deputy Hodgins is particularly hilarious in Holt’s “Avenging Rider” (‘43). In other outings “Professor” Hodgins outshines Smiley Burnette by 100 watts or more in Gene Autry’s “Oh, Susanna!” (‘36). As Luana Walters’ crusty, crotchety, supposedly blind uncle he was one of three murder suspects in “The Range Busters” (‘40). Andy Clyde is bamboozled by con-man Hodgins in “Colt Comrades” (‘43) w/Hopalong Cassidy and is delightful in a small but noticeable role of an inept, absent minded lawyer in Hoppy’s “False Colors” (‘43). 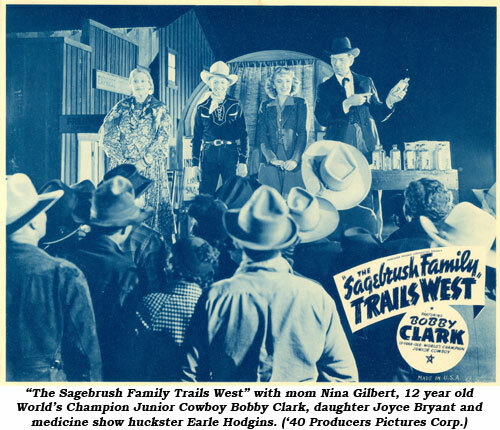 Along the way Earle even played comedic Indians in “Old Chisholm Trail” (‘42) w/Johnny Mack Brown and Tex Ritter and “Blocked Trail” (‘43) w/Three Mesquiteers. An actor he was, so he was cast as just that for delightful turns in “Oklahoma Badlands” (‘48) and “Hidden Valley Outlaws” (‘44) w/Bill Elliott. 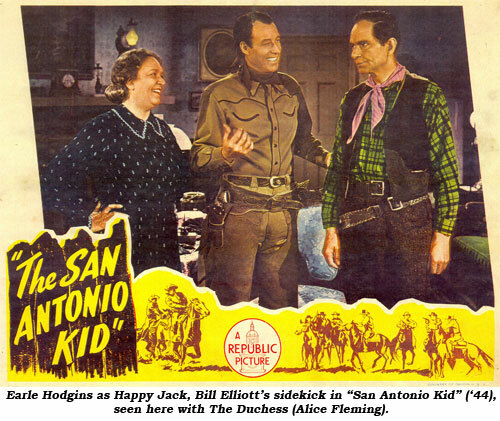 He even managed to ride as a sidekick (Happy Jack) to Elliott in “San Antonio Kid” (‘44). When television arrived, Hodgins transferred his multiple talents to the small screen. From ‘51-‘63 he was on over 100 TV episodes—multiple times on “Judge Roy Bean”, “Lone Ranger” (a recurring role as Barnaby Boggs [played earlier by Hal Price]), “Wild Bill Hickok” (very humorous as an old time Yankee Civil War vet feuding with Reb Fuzzy Knight in “Battle Line”), “Have Gun Will Travel” (watch “Silver Queen” for his touching portrayal of Leadhead), “Gunsmoke” (particularly effect as old prairie dog “Uncle Oliver”), and “Cisco Kid” (a traveling dentist, foreman, magician, storekeeper, deputy, even an outlaw doctor). Also seen on “Hopalong Cassidy”, “Range Rider”, “Maverick”, “Wichita Town” and many more. He even turned out to be (spoiler alert) Worthless, the vicious killer on “Sky King: Man Who Forgot”. His last work was as a judge on “Gunsmoke” in ‘63.